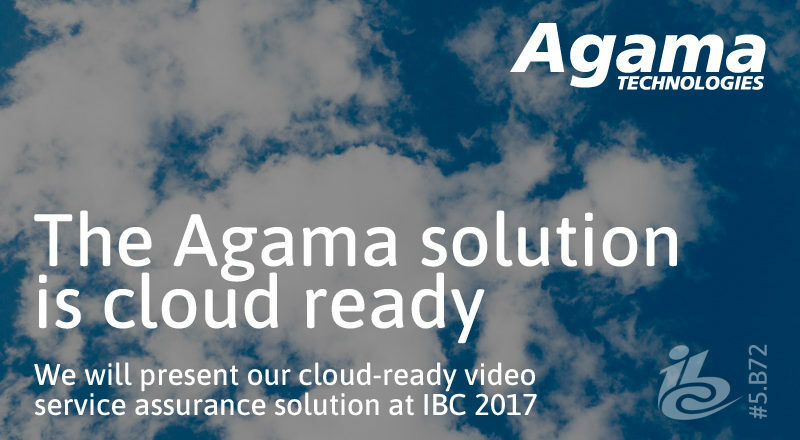 (Linköping, Sweden, August 30, 2017) – Agama Technologies, the specialist in video service quality and customer experience, will be presenting its cloud-ready, video service assurance solution at IBC2017. The solution is fully flexible and supports any mix of dedicated hardware, virtualization and cloud implementation. As video service solutions are increasingly being implemented in the cloud, monitoring tools must be cloud-ready too. In addition, the increasing use of analytics in the video service domain requires significant amounts of processing power and storage and can benefit from the cost-effectiveness of a cloud-based implementation. At the same time, an increased focus on security and privacy is motivating operators to retain full control over critical parts of their solutions by running them in-house or in another secure environment. To handle the transition to a mixed infrastructure, Agama’s video service assurance solution efficiently supports any mix of dedicated hardware, virtualization and private or public cloud implementation. With a long-standing focus on software-based solutions, Agama’s monitoring, assurance and analytics solutions are ideally suited to handle any deployment, now and in the future. “We see a lot of operators virtualizing parts of their solutions. This spans everything from individual functions, such as transcoding, to the entire back-end of the video solution. Parts of it are driven by outsourcing to service partners and parts by efficiency of implementation. In either case, we see the flexibility provided by virtualization as a key success factor,” says Anders Svensson, CTO, Agama Technologies. Agama Technologies specialises in empowering video operators’ business processes with awareness that can drastically lower operational costs and improve customer satisfaction. With extensive experience and an industry-leading solution for monitoring, assurance and analytics of video service quality and customer experience, Agama helps operators to implement a data-driven way of working to assure optimal service quality, improve operational efficiency and increase customer understanding. The company is based in Linköping, Sweden, and is privately held.